Ready to make your annual farm pilgrimage for the kids to pick a pumpkin? These days, pumpkins are just the beginning. You can choose from a huge range of activities, from simple pumpkin patches to intricate corn mazes, pumpkin cannons, petting zoos and more. Here are some of our readers' favorite places for harvest fun in the South Sound and beyond. Also see our greater Seattle-area pumpkin patch picks (including Snohomish County, the Eastside and South King County), and top places to go apple picking and sweet apple events for families during fall 2018. 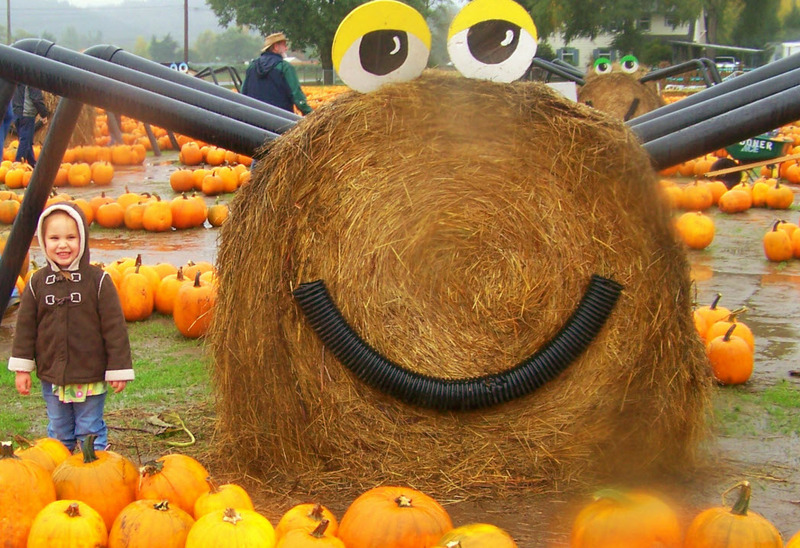 Known for: Ton of pumpkins, pumpkin slingshots and hay rides. Patch action: During October, this third-generation family farm features a five-acre corn maze and a large selection of pumpkins. Try your hand at one of three pumpkin slingshots, including one just for kids, and enjoy free tractor-pulled hay rides on the weekends and chickens and a turkey for kids to visit. Concessions are also available on weekends. Dates and hours: Open as of Saturday, Sept. 29; 10 a.m.–6 p.m. on weekends, 3–6 p.m. on weekdays through Oct. 31. Check Facebook page for updates. Location, cost and details: 5820 44th St. E., Puyallup; 253-227-5385. Corn maze $5 per person, ages 3 and under free. Pumpkin slingshot $1 per shot. Pumpkins: 29 cents per pound. Known for: Free small corn maze and animals. Patch action: This fourth-generation family farm is famous for locally grown sweet corn and the Pumpkin Palace in October. Perfect for the younger crowd: visit acres of U-pick pumpkins, free small corn maze, farm animals (including pigs, turkeys, lambs, goats and donkeys), cute displays, painted pumpkins, gourds, squash and other fall crops. Leashed, friendly dogs allowed. Dates and hours: U-pick open daily starting Monday, Oct. 1 through Oct. 31, 9 a.m.–6 p.m.; Check Facebook page for updates. Educational tours by appointment in October only. A small retail store is open daily from 9 a.m.–6 p.m., April through October. Location, cost and details: 14310 128th Street E., Puyallup; 253-848-7604. Admission and corn maze free; pumpkins for purchase. Known for: Animals galore, fun for all ages. Patch action: Family favorites at this fifth-generation family farm include Pumpkin Pete's Playtown, duck races, pony rides, pumpkin slingshots, a corn maze, face painting and a huge pumpkin patch. Note: Most activities are only open on weekends. No pets please. Date/hours: Open daily, Sept. 29–Oct. 31, 9 a.m.–6 p.m. Corn maze open 10 a.m.–5:30 p.m. on weekdays and 9 a.m.–5:30 p.m. on weekends. Slingshot open 3 p.m.–6 p.m. weekdays, 9 a.m.–6 p.m. weekends. Check Facebook page for updates. Location, cost and details: 710 State Route 162 E., Puyallup; 253-840-2059. Admission free. Corn maze $7 per person on weekdays, $9 per adult (13 and up) and $7 per child on weekends, kids 2 and under are free. Known for: Trivia corn maze, non-scary fun and live bluegrass music on select weekend dates. Patch action: This family farm offers fun without the scary stuff. Enjoy the pumpkin patch, hayrides, pumpkin slinging (hit the target and win 15 pounds of free pumpkins! ), and a seven-acre corn maze with trivia. If you can find the answers to the eight questions hidden throughout the maze, you'll win a prize. Leashed dogs allowed (but not in the maze or hayrides). Dates and hours: Open Sept. 29–Oct. 31, weekends 10 a.m.–6 p.m. and weekdays 3–6 p.m. Hayrides offered daily beginning Oct. 13. Check Facebook page for updates. Location, cost and details: 6502 52nd Street E., Puyallup; 253-841-4443. Admission free. Corn maze $6 per person, ages 3 and under free. Hayride $3 per person, age 1 and under free. Slingshot $1 per shot. Train Rides (on weekends) and Kiddie Train $1 per person. Group rates available for the corn maze and hayride. Known for: Multiple activities — go fishing and pick a pumpkin on the same day! Patch action: This farm/fishing spot has lots to explore in the fall. Kids can play a not-so-scary Halloween I-spy game that will guide them to look for haunting decorations down a forest trail. Back at the farm, choose a pre-picked pumpkin, ride the ponies or the train (dry weather only), and bang around in the musical forest. Bonus: Try your hand at fishing. $6 per fish caught (no catch and release), which includes cleaning. There is also a $2 pole rental fee and a $2 fee for bait. Dates and hours: Pumpkin patch opens October 5th. Open Friday–Sunday, 10 a.m.–6 p.m. Check Facebook page for more details. Location, cost and details: 4924 268th Street, E., Spanaway; 253-875-0356. General admission $8 (access to the farm, Eye Spy Trail, Musical Forest, gravel pit, play areas, exotic animals and barn); under 2 free. Pony ride $5. Train ride $6. Known for: Awesome cider, goat walk and tasty treats. Patch action: While known (and named) for its apples and award-winning cider, Lattin's offers lots of fall farm fun, including wagon rides to the pumpkin patch, games, face painting, petting farm, pony rides, a Goat Walk and more. Snack on tasty apple treats from apple fritters to apple pie, apple cake, cider, cider doughnuts and more. Dates and hours: Apple Festival starts the last weekend in September and continues every weekend in October, 9 a.m.–5 p.m. Check Facebook page for updates. Location, cost and details: 9402 Rich Road S.E., Olympia; 360-491-7328. Admission is free, parking $5. Prices vary for activities. Known for: Zombie paintball and kid-friendly corn maze with games. Patch action: Fun for all ages, this farm features a haunted maze and a "Zombie Paintball Apocalypse" for older kids (or adults) after 8 p.m. and plenty of activities for little ones during the day. Activities include a corn train shuttle, cow train ride, eight-acre, kid-friendly mazes with two games you can choose from. Hear the story of "Spookley the Square Pumpkin" and engage in a pumpkin hat craft project Saturdays and Sundays on the hour starting at noon with last reading at 4 p.m. New this year is an industrial swing set and horseshoes for fun for all ages! Dates and hours: Maze open Sept. 22–Oct. 31, Friday–Saturday, 10 a.m.–midnight (last ticket sold at 10 p.m.) and Sunday–Thursday, 10 a.m.–6 p.m. (last ticket sold at 5 p.m.). Pumpkin patch open daily Sept. 29–Oct. 31 from 10 a.m.–6 p.m. Check the website or Facebook page for more details. Location, cost and detalis: 302 93rd Ave S.E., Tumwater; 360-357-3700. Daytime admission (10 a.m.–5:59 p.m.) is $8 per person, evening admission (6 p.m.–midnight) is $12 per person, ages 4 and under free. Pumpkins $0.40–$0.50 per pound. Prices vary for activities. Check website for combo pricing. 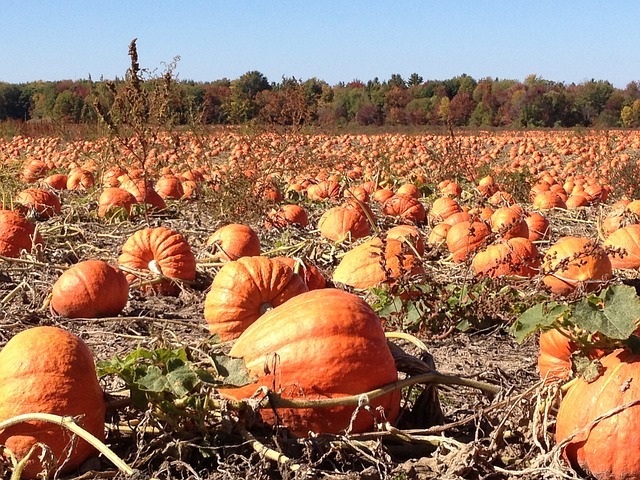 Known for: Roasted corn, kettle corn and huge array of pumpkins. Patch action: Carpinito Brothers offer U-pick pumpkins, two giant corn mazes and yummy harvest snacks like roasted corn on the cob. With a new design every year, this year's intricately designed maze features a dinosaur theme! Visit the Farm Fun Yard across the street to visit the farm animals, take a tractor-drawn hay ride, race rubber ducks, explore the hay maze, feed the goats on the goat walk and "swim" in the corn pen. Dates and hours: Open daily Sept. 28–Oct. 31, 9 a.m.–6 p.m. Check Facebook for updates. Location, cost and details: Patch and corn maze: 27508 W. Valley Hwy N., Kent. Farm Fun Yard: 6720 S 277th St., Kent; 253-854-5692. Call for pricing details. No pets, please. Known for: Huge corn maze, corn box for kids and tractor train rides. Patch action: Another reader favorite in South King County, this working dairy farm runs a 216,000-square-foot corn maze during pumpkin season, plus old-fashioned farm attractions such as apple-lobbing slingshot competitions, tractor train rides, hay rides, hay maze, duck races, petting farm, a corn box (filled with nine tons of corn) for the kids and more. A returning favorite: Solve the mystery in the Pacific Northwest-themed maze or try laser tag. Location, cost and details: 38223 236th Ave. S.E., Enumclaw; 360-802-0503. Multiple packages ranging from $3–$12 on weekdays and $5–$20 on weekends depending on activities chosen. Free parking. See website for details. No pets allowed. Known for: Personalized pumpkins. Next year order by Aug. 31 to have names, etc. scratched into young pumpkins and then search for your special pumpkin in the patch when it comes time to harvest! Service is $5 for up to 10 letters. Pumpkins sold by final weight. 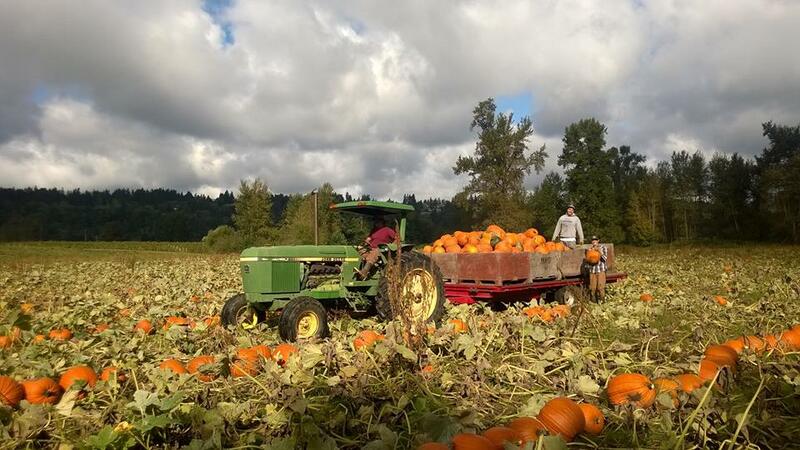 Patch action: Located in Port Orchard, Creek House raises organic, heirloom pumpkins and offers U-pick pumpkins, farm animals to visit, autumn crafts and opportunities for photos. Dates and hours: Open in October on Fridays, noon–6 p.m.; Saturdays, 10 a.m.–6 p.m.; and Sunday, noon–6 p.m. until the pumpkins sell out. Check Facebook page for updates. Location: 6060 E. Collins Rd., Port Orchard. Bring hand sanitizer, as many places have only portable toilets. Dress appropriately: boots for muddy farm trails and layers for typical Seattle drizzles. Mud-proof the trunk for muddy pumpkins and boots. Bring spare shoes for the ride home. Have cash on hand for activities and food. Leave the stroller behind... and the dog. Typically you'll have a bumpy landscape to traverse, and most places are not dog-friendly. Editor's note: This seasonal article is updated every year, most recently in 2018.